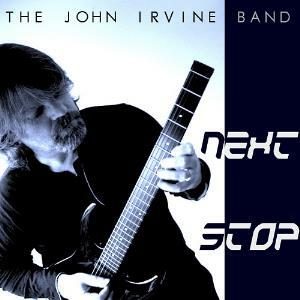 After the highly acclaimed debut Wait And See (2011, see review), guitarist John Irvine returns with a successor called Next Stop. The other members of this Scottish super fusion band are Doug Kemp (bass) and Alan Emslie (drums). Both musicians were present on the previous CD of The John Irvine Band as well. These excellent musicians have been challenged to record a second album which at least has to be just as good as the first one or even better. After a few spins of Next Stop in my player I noticed a number of similarities compared to the debut, but while attentively listening I also heard new influences. On Wait And See, the influences of Allan Holdsworth were blended with the lyrical elements of Pat Metheny and I certainly heard the sound of The David Becker Tribune in their music. These influences can still be heard in songs like Next Stop, Your Skyline and A Straight Line. However, this time I frequently heard guitar parts that reminded me of Frank Gambale. This can clearly be heard in Pyramid Power and Slipstream of which the latter also contains touches of Robben Ford and Michael Landau. Al these influences have been blended into John Irvine's own musical style. The final composition A Means To An End contains something special. It starts as a relaxed soft fusion song, but halfway through the atmosphere changes and then the sound of Rush, my all-time favourite band, emerged. The song sounds like a kind of transcription of Red Barchetta embedded in a fusion song. What a strong way to end an album! This is a true mixture of fusion and prog rock. After a few spins more, I discovered more Rush references that I didn't hear before the big hint in the final composition. If you listen to the opening seconds of Pyramid Power it's easy to tell to which song it refers provided that you are familiar with the music of Rush. The John Irvine Band did it again! They delivered a second album which is just as good as the debut. Next Stop is a very accessible classy fusion album played with emotion and passion. It's the perfect second album any fusion guitarist would like to record. If you happen to like Rush as well, you'll find some nice references.